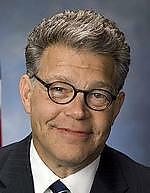 Info You might know Al Franken as an award-winning satirist and author. You might know him as the host of Air America Radio's "The Al Franken Show," the network's flagship program that helped put progressive talk radio on the map. And if you're a Minnesotan, you might know him from bumping into him at a DFL event or two. Here's how Al got to where he is today. Born in New York on May 21, 1951, Al moved with his family to Albert Lea, Minnesota at the age of four. Al likes to tell this story about the move. My dad never graduated high school and never had a career as such, but my mom’s father, my grandpa, owned a quilting factory out East and gave my dad a chance to start up a new factory in Albert Lea. After about two years, the factory failed, and we moved up to the Twin Cities. And he said, “Well, it went through Albert Lea, but it wouldn’t stop." "The Luckiest Kid in the World"
When Joe Franken's quilting factory went under -- as Al likes to say, his dad was a "great guy, but a terrible businessman" -- the family moved to the Twin Cities. Al, his parents, and his brother Owen lived in a two-bedroom, one-bath house in St. Louis Park. Growing up middle-class in Minnesota back then meant that while the Frankens weren't rich -- his dad ended up getting a job as a printing salesman while his mom worked as a real estate agent -- they had a feeling of security and access to opportunity. As Al puts it, he felt like the luckiest kid in the world. His good grades got him into Harvard, but his friendship with fellow Minnesotan Tom Davis(Tom grew up in Richfield) and their performances in school and at Dudley Riggs's Brave New Workshop in Minneapolis led him to try his hand at comedy after graduating. Al and Tom Davis soon caught on with a show called "Saturday Night," splitting a weekly paycheck of $350 as "apprentice writers." Over the next two decades, Al would be awarded five Emmy awards and seven nominations for his work on the show, which you might know as "Saturday Night Live." Al's creations ranged from the silly (a self-help guru named Stuart Smalley) to the bitingly satirical (portraying the Rev. Pat Robertson in mock "debates"). Al also wrote for the big screen, where his screenplays included "When A Man Loves A Woman," a serious take on the family disease of addiction, as well as on television, where he created "Lateline," a send-up of political news programs. At a mixer his freshman year, Al met Franni Bryson, a freshman at Simmons. When she was seventeen months old, her dad – a decorated veteran of World War II – died in a car accident, leaving her mother, my mother-in-law, widowed with five kids. My mother-in-law worked in the produce department of a grocery store, but that family made it because of Social Security survivor benefits. Sometimes there wasn’t enough food on the table, sometimes they turned off the heat in the winter – this was in Portland, Maine, almost as cold as Minnesota – but they made it. Every single one of the four girls in Franni’s family went to college, thanks to Pell Grants and other scholarships. My brother-in-law, Neil, went into the Coast Guard, where he became an electrical engineer. And my mother-in-law got herself a $300 GI loan to fix her roof, and used the money instead to go to the University of Maine. She became a grade school teacher, teaching Title One kids – poor kids – and so her loan was forgiven. My mother-in-law and every single one of those five kids became a productive member of society. Conservatives like to say that people need to pull themselves up by their bootstraps – and that’s a great idea. But first, you’ve got to have the boots. And the government gave my wife’s family the boots. They've been married for over 32 years, "many of them happy," as Al likes to joke. They have two kids. Thomasin, 27, graduated from Harvard and became a teacher, working in a public elementary school in the Bronx. Joe (named after Al's dad), 23, is a recent graduate from Princeton with a degree in Mechanical Engineering. When Al left "Saturday Night Live" in 1995, Newt Gingrich's Republican Congress had just taken power. Although Al had refrained from injecting his own politics into his work as a comedian, watching these Republicans and their obnoxious radio mouthpiece, Rush Limbaugh, take aim at Al's core values was too much for him to let stand. Making people laugh is the best thing in the world. But when I wrote the Rush book, people would come up to me and say, "Thank you. Thank you for saying what needed to be said." And that was really something. In 2003, with George W. Bush in the White House and another Republican Congress once again using its media mouthpieces to hold power, Al was named a fellow at Harvard's Shorenstein Center on Press, Politics, and Public Policy. There he wrote his next #1 New York Times best-seller, "Lies and the Lying Liars Who Tell Them: A Fair and Balanced Look at the Right." In 2005, he followed with another #1 New York Times best-seller, "The Truth (with jokes)." "The Al Franken Show is on the Air!" On March 31, 2004, a brand new part of the progressive movement celebrated its first day on the air. Air America Radio was the first progressive talk radio network, and Al was its first star. Broadcasting live, three hours a day, five days a week, Al figured he might as well learn from the experience. So in addition to his own famous wit and passion, the show featured experts in domestic and foreign policy, national and world leaders, and issues ranging from the cost of prescription drugs to the war in Iraq to the Bush administration's misuse of scientific research. The show reached over 1.5 million unique listeners per week, and Al was soon ranked among the most influential radio talkers in the country, quite an achievement given the conservative bent of established hosts. In addition, Al continued to be in high demand as a speaker at Democratic functions around the country, especially back in his native Minnesota. Al has visited our troops overseas with the USO seven times. He's been to Iraq four times. These trips are the highlight of his year. Visiting a war zone with the Sergeant Major of the Army is an opportunity to visit with members of the armed services, speak with generals, and see first-hand "how it's going over there." In 2005, Al wrote about his trip in a photo essay on the Midwest Values PAC website. When Al's son went off to Princeton, Al and Franni found themselves empty-nesters and decided to move back to Minnesota. Al's political philosophy had always been informed by his friend and hero, the late Sen. Paul Wellstone, and when he moved home at the end of 2005, he found that the spirit of Wellstonian progressive politics was still very much alive. Al founded a political action committee, Midwest Values PAC, which raised over $1.1 million for Democrats across Minnesota and around the country. He made more than 50 appearances on behalf of DFLers and local party units in the state in 2006 alone. He was especially inspired by two candidates he met on the campaign trail: Tim Walz, a high school geography teacher whose relentless energy propelled him to an upset victory over a Republican incumbent in the 1st Congressional District (Al stole his "boots" line from Tim); and Amy Klobuchar, whose strong positive message of change helped her follow in the footsteps of Hubert Humphrey, Walter Mondale, and Paul Wellstone as she was elected to the United States Senate. Americans have never backed away from challenges. And Minnesotans have always led the way. Our state has sent strong, progressive leaders to Washington—from Hubert Humphrey to Walter Mondale to Paul Wellstone, and now to Amy Klobuchar. Minnesota's public servants might not always look and sound like typical politicians, but they stand by their principles and lead by their values. That's the kind of leader I think we need more of these days, and that's the kind of Senator I'll be.